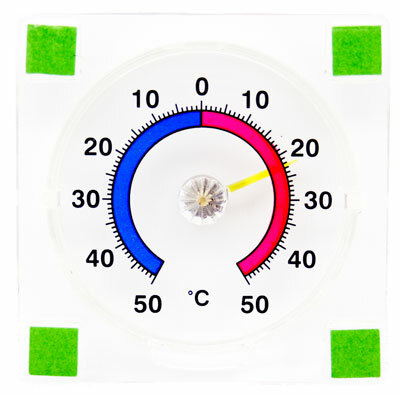 The Window Thermometer uses a colour coded dial to visually illustrate the temperature measured, using blue for minus temperatures and red for temperatures over 0ËšC, making it easier to read. The adhesive back means that the window thermometer easily sticks onto your chosen window to record the outside temperature. Needed some inexpensive but reasonably accurate thermometers to check hot/cold areas around the house. These thermometers have so far proved to be both. Thermometer itself is very good value, but when you peel off the plastic the sticky pads are no longer sticky, maybe it's old stock. Ended up using my own glue. Arrived quickly. Easy to read. Only one grouse: - the sticky pads had lost their adhesion on the one we opened. Used super glue and all is well. Still to try the second one we bought for a friend.